Topps Garbage Pail Kids are releasing the first in a limited comic book series about the WORST of 2016. Please check out the content of today's blog post and link to comic book No. 1. Seems the Garbage Pail Kids agree. Topps is launching a new comic book line today starting with Issue No. 1 - Worst of 2016. 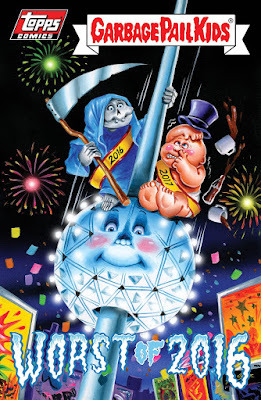 It features Grim JIM and Nervous REX – with a guest appearance from New Year’s EVE. GPK is ringing in the New Year by highlighting the worst of 2016. Follow classic GPKs “2016 Father Time” Grim JIM and “2017 Baby New Year” Nervous REX as they take a look back at the worst that 2016 had to offer. The Worst of 2016 is an eight-page exclusive comic book that comes with two exclusive stickers. Each book, plus stickers, will run $19.99 and only found at Topps.com. The package will be on sale for a limited time of just one week. Renowned GPK contributors Pat Barrett wrote the comic and Brent Engstrom illustrated it. Joe Simko painted the cover artwork. Nervous REX is an original GPK character from the first series and Grim Jim first appeared in the third series. Get your Issue No. 1 here, and be on the lookout for issue No. 2 next week.